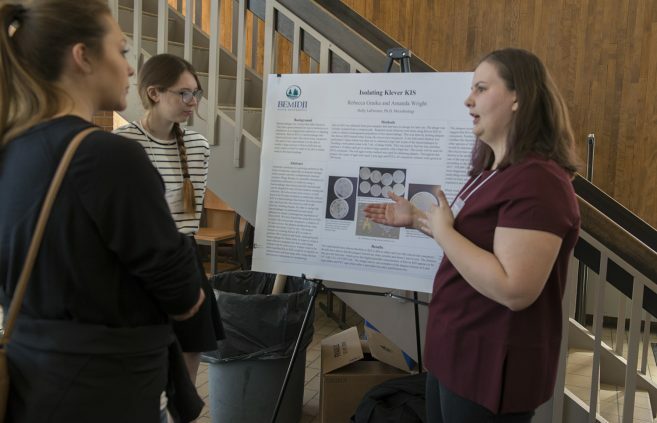 Lauren Bench and Abigail Halluska showcase their research on Iron and Vitamin B12 Content in Kombucha through a poster presentation to Dr. Keith Marek and Dr. Julie Larson, both professors of chemistry at BSU. 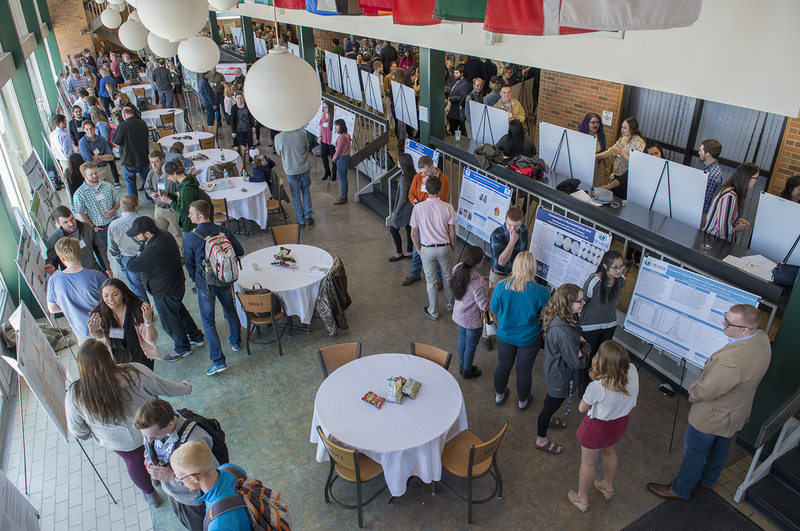 Student poster presentations filled Lakeside in the HMU’s Lower Union. 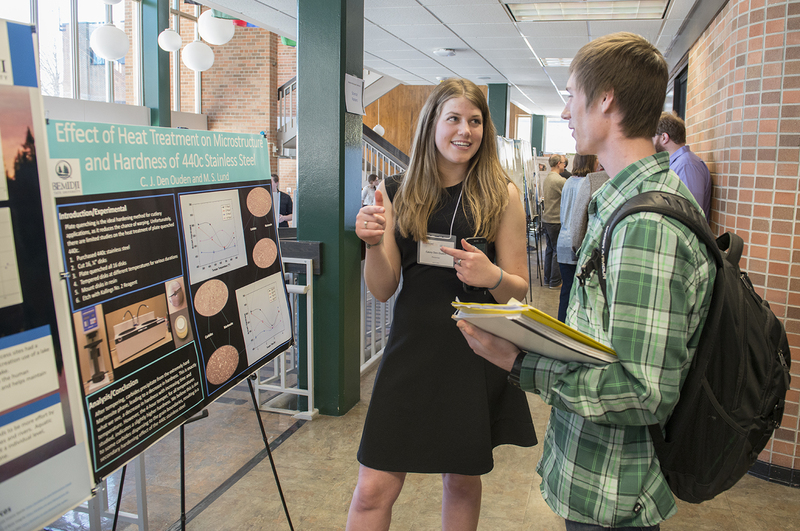 “Effect of Heat Treatment on Microstructure and Hardness of 440c Stainless Steel” poster presented by C.J. Ouden and M.S. Lund. “Climate Change on a Small Scale: Does Climate Affect MN Lakes?” poster presentation by Samuel Potrin. 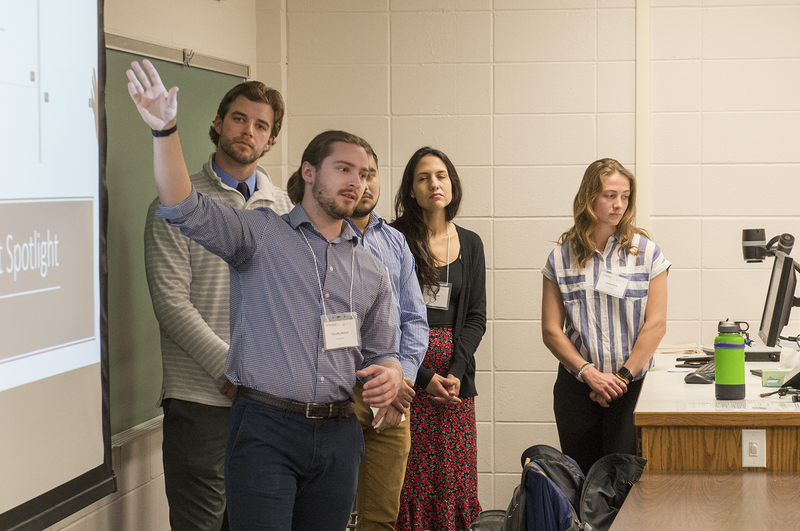 Aili Kultala and Jon Barcenas present their sustainability research. “Isolating Klever KIS” poster by Rebecca Graika and Amanda Wright. 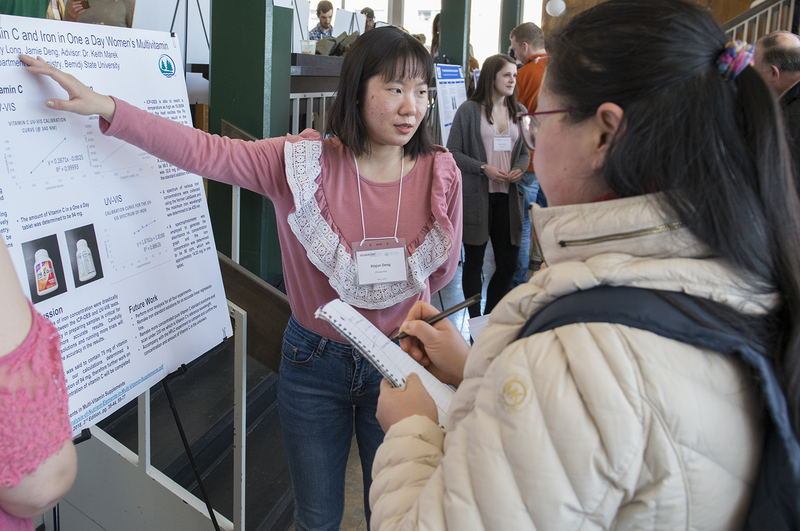 “Determination of Vitamin C and Iron in One a Day Women’s Multivitamin” poster by Xiajun Deng and Emily Long. Kristin Farris, Jalen Frye, Kallie Hoplin and Joseph Richmiller present their research on retention. 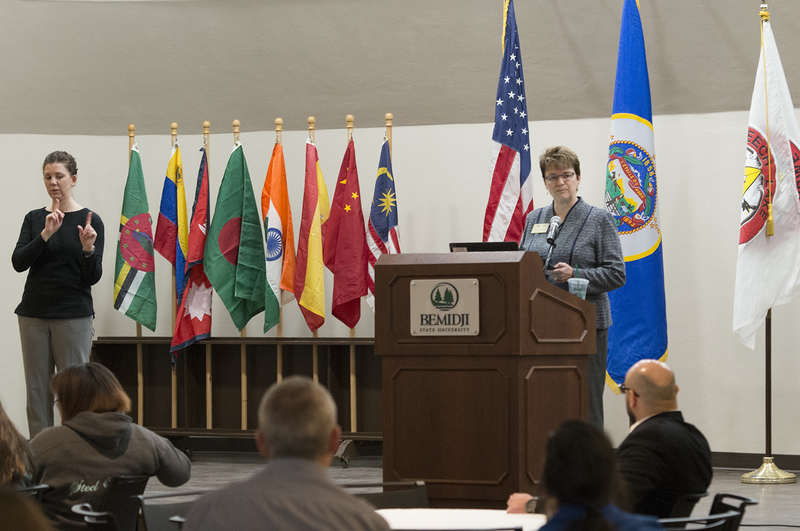 Serena Graves speaks on how the Ojibwe language helped her find her identity as a Native American woman. 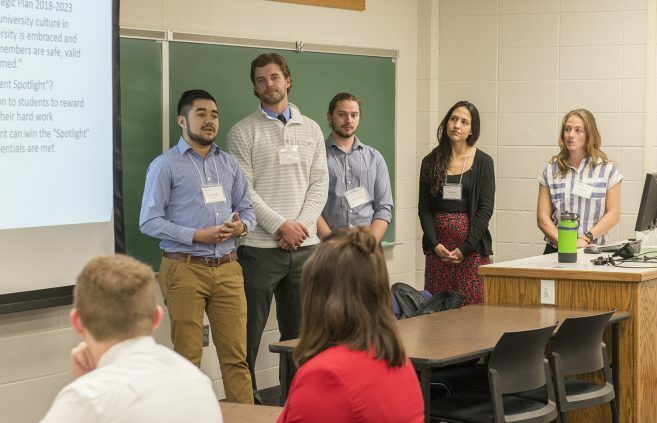 President Student Commissioners Jared Henning, Timothy Nelson, Tia Neuharth, Donelle Omer and Rupesh Thapa proposed an idea to shine a spotlight on student achievements to boost student retention at BSU. Ed Galindo, keynote speaker, spoke about his rich history of conducting research with Native American students and shared his best practices with students, faculty and staff. Students, faculty and staff filled the Beaux Arts Ballroom for the 20th annual Student Achievement Conference at BSU. 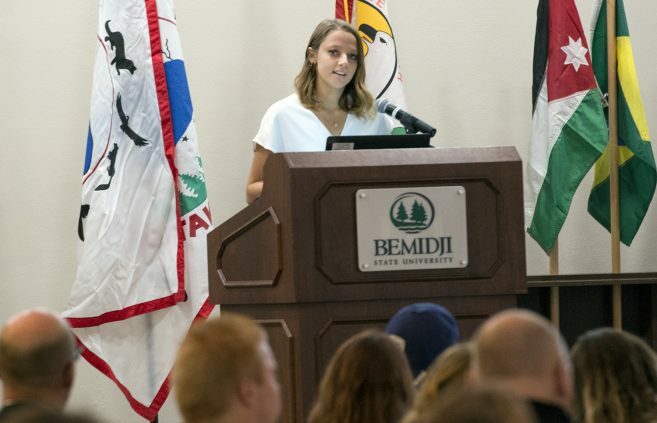 Savannah (Anna) Corradi, Bemidji native and 2019 recipient of the Bemidji State University Award of Excellence in Academic Achievement, was the student keynote speaker. President Hensrud welcomed the crowd to the 20th annual Student Achievement Conference. 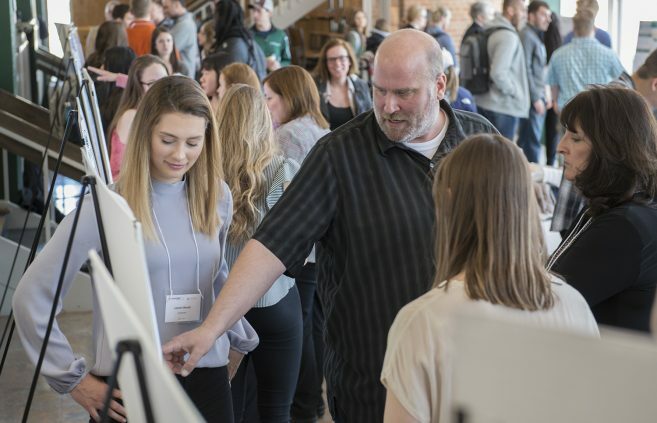 Bemidji State University students presented the results of their academic efforts in a day-long series of oral presentations, poster displays, art exhibits and musical performances on April 3 at the university’s 20th Annual Student Achievement Conference. 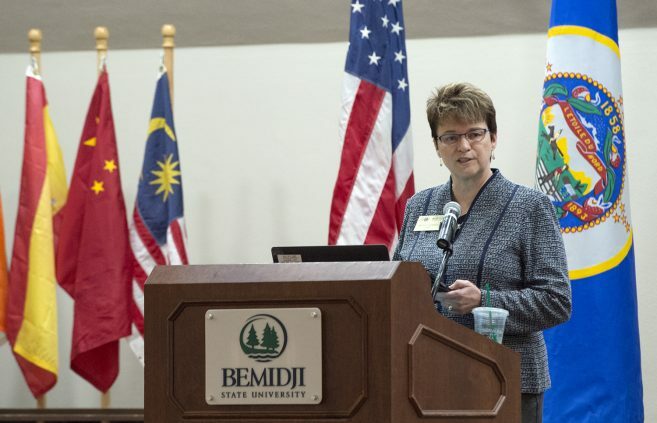 BSU President Faith C. Hensrud praised the students, faculty and staff participants for their work during the opening remarks of the conference’s kickoff breakfast. 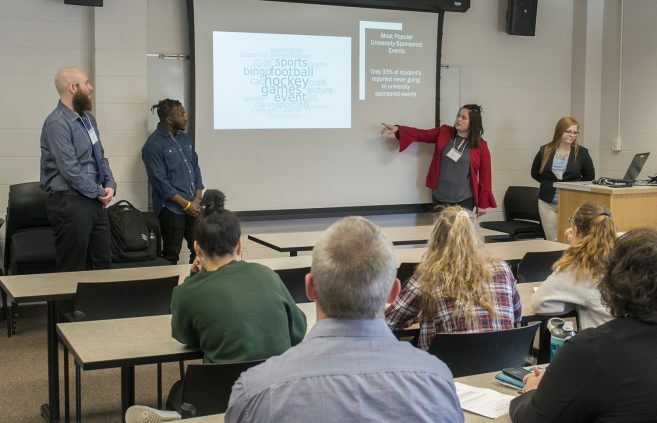 She added that the academic and artistic achievements on display at the conference speak to BSU’s mission of teaching and exploration, as well as the vision to encourage students to lead inspired lives. 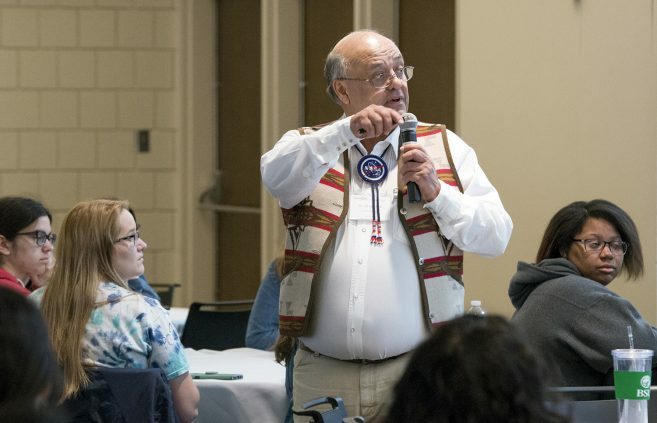 Dr. Ed Galindo, faculty member at the University of Idaho and associate director for education and diversity for the NASA Idaho Space Grant Consortium, was the 2019 keynote speaker. 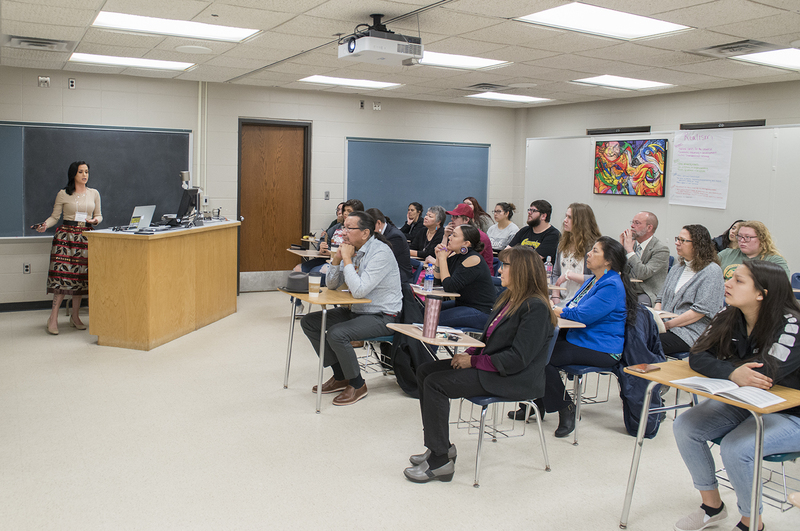 Galindo spoke about his rich history of conducting research with Native American students and shared his best practices with students, faculty and staff. 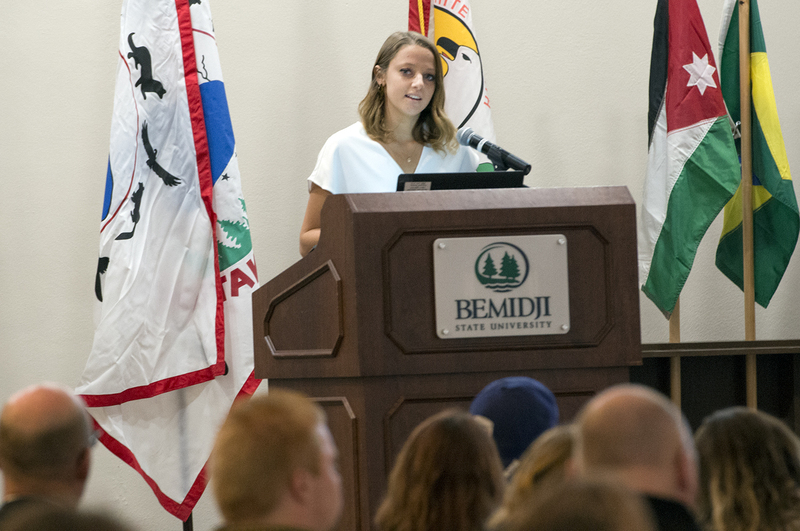 The opening ceremony also included a new, 15-minute student keynote presentation by Savannah (Anna) Corradi, Bemidji native and 2019 recipient of the Bemidji State University Award of Excellence in Academic Achievement. 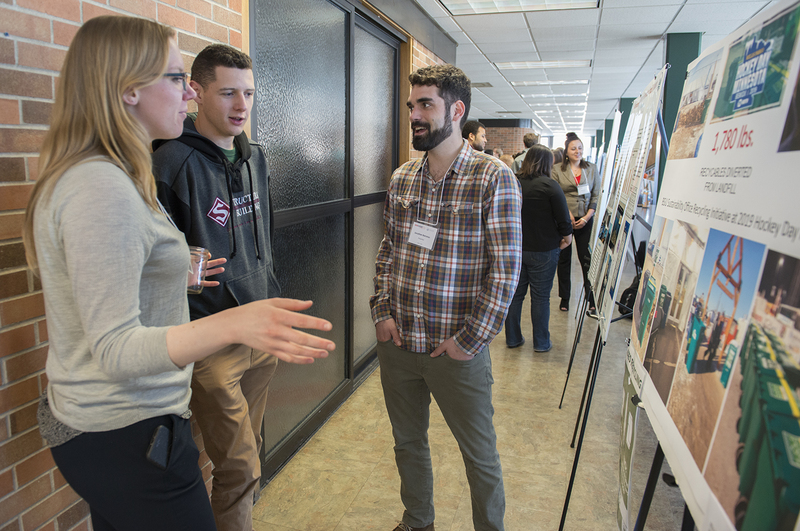 Corradi began working with Dr. Mark Wallert, professor of biology, when she was a junior in high school after he presented to students in her class. She is now a BSU sophomore studying chemistry and researching ovarian cancer treatment. Wallert welcomed Corradi to the stage and praised her for her dedication, drive and ambition. “Anna’s only a sophomore. I look forward to seeing what she will achieve as a senior and I’m even more excited to see what she does when she gets her Ph.D.,” he said. 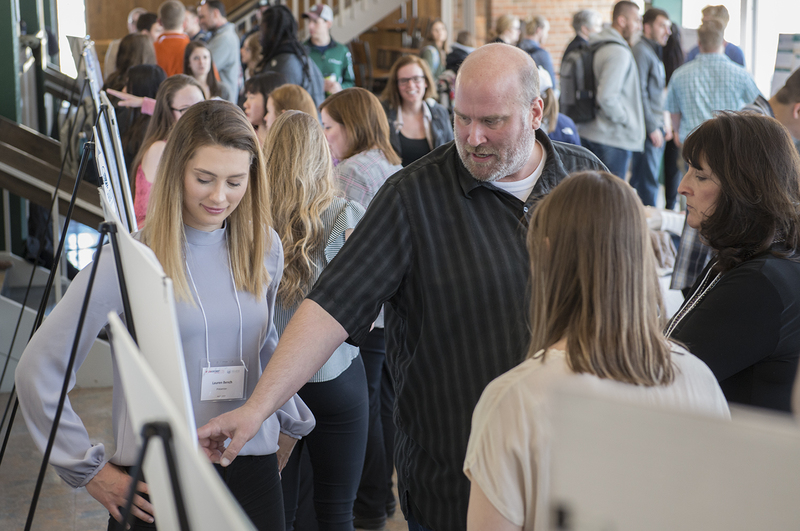 The conference featured over 175 projects and presentations by nearly 280 students representing a wide variety of academic majors and programs, with additional students participating in invitational displays featuring design, fine arts and music. 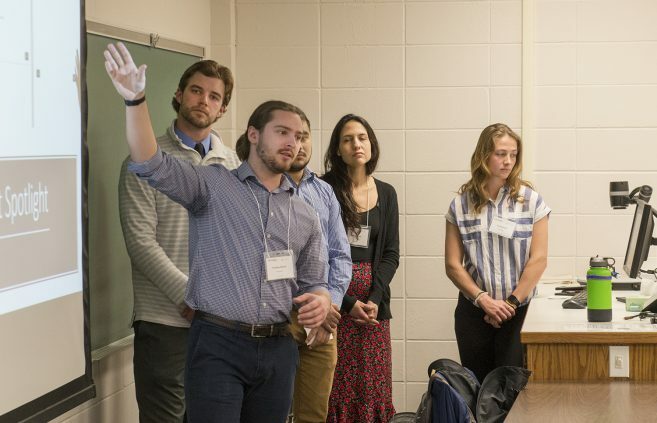 More than 50 students gave oral presentations on subjects including solar-powered food dehydration, for-profit prisons, sonata theory in Schubert, BSU centennial clock making, native flute construction, amphipod colonization and density and how to use sustainable technologies to address local food security. 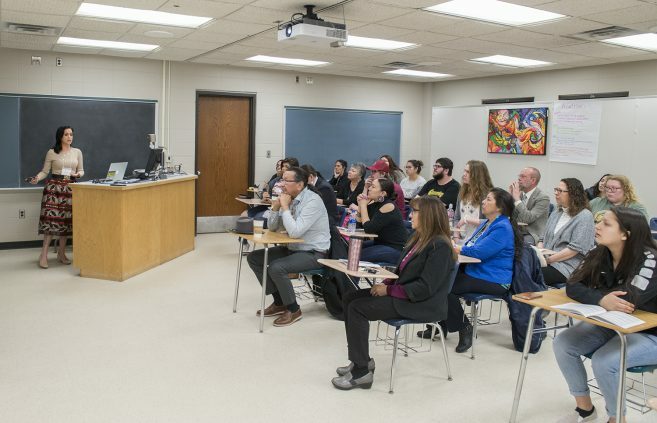 Triple-major Sam Galatz, a senior from Hector, Minn. studying English, Spanish and creative and professional writing, presented their multi-genre writing following the character Jeremy, a young adult hospitalized after a mental breakdown. Galatz shared excerpts from their book entitled “Aether” including narrative, poems and personal experience. Aili Kultala, a senior from Stacy, Minn. majoring in environmental studies, and Jon Barcenas, a senior from Bemidji, Minn. studying project management, presented their findings from analyzing contamination trends in waste found in Hagg-Sauer Hall over five consecutive days during the fall semester. 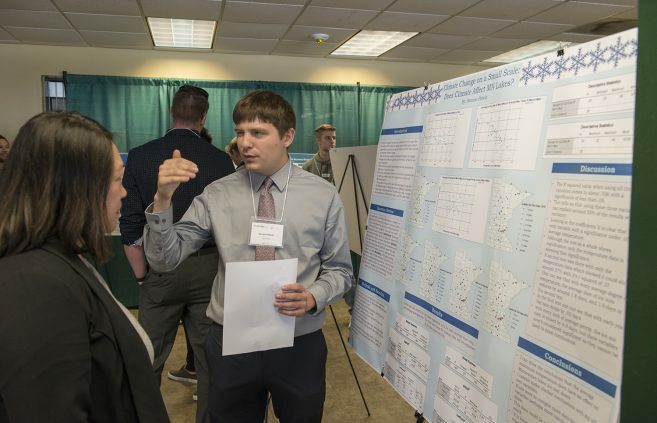 President Student Commissioners Jared Henning, a senior from Jackson, Wisc. 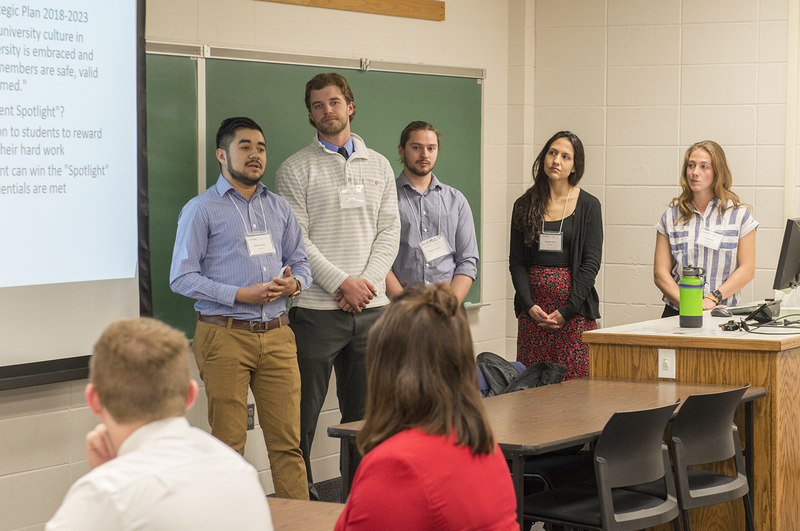 studying business administration, Timothy Nelson, a senior from Minneapolis, Minn. studying physical education, Tia Neuharth, a junior from Savage, Minn. studying nursing, Donelle Omer, a sophomore from Bemidji, Minn. studying psychology, and Rupesh Thapa, a senior from Bemidji, Minn. studying computer information systems, proposed an idea to shine a spotlight on student achievements to boost student retention at BSU. 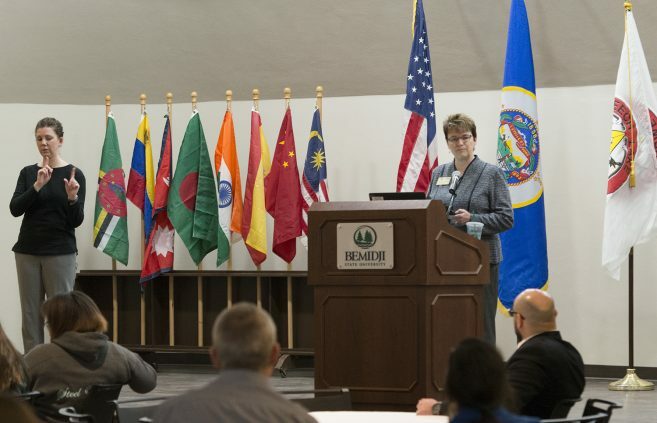 When asked why the group was interested in this topic, Thapa pointed to creating a positive culture. 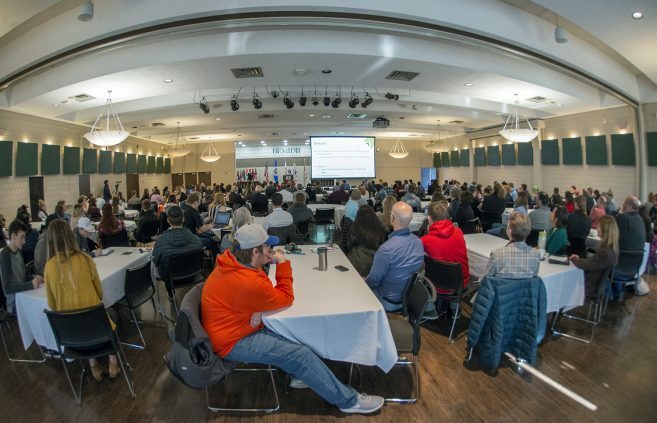 “We want to focus on diversity and retention at the same time and create a sense of belonging for all students here at BSU,” he said. 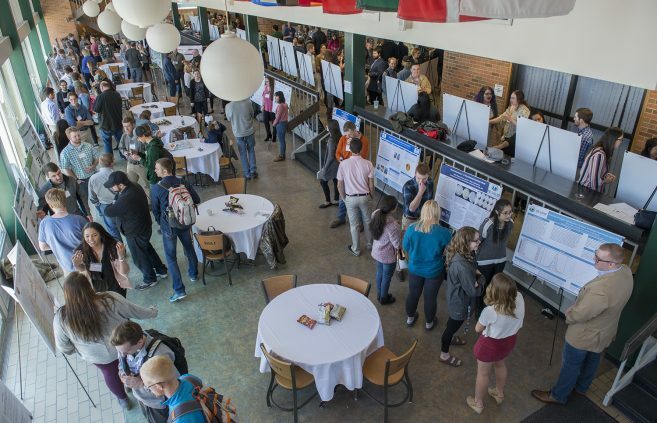 Poster presentations by 110 students included topics such as factors contributing to youth homelessness, brown bear harvest rates in Alaska, a spatial analysis of bumblebee populations, adolescent substance abuse, an assessment of the future impact of artificial intelligence, cultural appropriation and the history of Native American mascots and the effects of rainbow trout on brook trout populations.